Important Announcement! 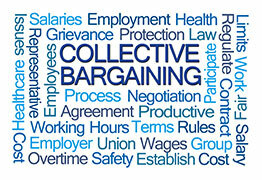 Bargaining was held on February 21. AASD is pleased to announce that we reached a tentative agreement on four articles (two classified, two certificated). The most important news to report is that in a tentative agreement on Article 5, Hours of Employment, AASD was able to reach agreement with the District to change the ongoing permanent work year reduction to a temporary two-year furlough!!!! What this means is that instead of the work year reduction days being ongoing there will be a sunset (ending) date of June 30, 2019. On July 1, 2019, the furlough days will be restored and salaries will be adjusted accordingly. This is great news for our unit. Our members have been on an ongoing 11, 12 or 14 day permanent work year reduction which has resulted in workload issues, vacation accrual problems, and loss of salary. Through the diligent work of your union over the past year, these issues have been shared with Board of Education members and district leadership. They listened. And did the right thing! For those 10-month classified unit members (particularly Food Services Supervisors and Area Supervisors), this means that effective July 1, 2019, the “smoothing” (pay spread over 11-months) will cease and revert back to 10 pay. In addition, the forced vacation at holiday periods will return. For our AASD units (classified and certificated), effective July 1, 2019, the individual flexible calendar option will cease. District work calendars will be designed and employees must follow those calendars unless they are on an approved type of leave. (For 2018-19, individual flexible calendars may still be submitted.) In addition, a tentative agreement was reach on Article 7 for both classified and certificated AASD members. Our next bargaining session is March 7, 2018. For copies of the tentative agreements, please see the February 22 Weekly Update.